Scientists use volcanoes’ pre-eruptive behaviors, such as increasing seismic activity, to warn that an eruption may be imminent. But what happens when a volcano doesn’t explode, and people begin to think the scientists are crying wolf? 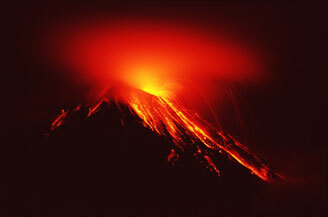 Enter the case of Tungurahua, Ecuador. New studies of the volcanic rocks from previous eruptions of the Yellowstone supervolcano and its predecessors give researchers insight into possible future eruptions at America’s first national park. 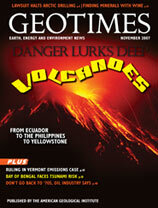 Massive volcanic eruptions may be rare, but they can be deadly, as millions of people live in the shadow of a volcano. A new analysis examines which parts of eruptions are the most hazardous to humans. Have you taken a "carbon footprint" survey to see what influence your lifestyle has on Earth? No Arctic drilling for Shell? How does your continent grow? BOOKS: Deciphering the Roles of Science, Policy and Politics: Q&A With Author Roger Pielke Jr.
As the prices of minerals rise and the technologies to find them improve, some companies are beginning to explore a new frontier — beneath the sea. Thanks to the Lifestyle Project, which tests students’ eco-awareness and then challenges them to make changes, students are realizing that even minor changes in behavior can help the environment. The world’s coastlines are being developed, despite calls from scientists to protect natural systems. The public needs to heed these calls, or disaster could await. Congress passed and the president signed the America COMPETES Act this fall. The act is designed to promote science and technology education and, if funded as designed, is a win-win situation for everyone. Those pesky mnemonic devices you learned in grade school can come in handy in college and at work when trying to remember everything from the planets’ order to rock hardness. Ecuador’s Tungurahua volcano has been erupting intermittently for the past eight years. Read more in this issue. Photo is courtesy of Alois Speck, CGVG-USFQ.